We are radio amateurs interested in the technical aspects of amateur radio. We encourage continued support and participation in area radio clubs. 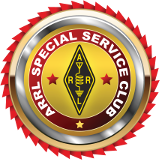 We strive to advance the general level of technical expertise and experience for support of those clubs and for amateur radio in general. To accomplish these goals, we will have periodic meetings, form and encourage technical special interest groups, sponsor license classes, and promote an “Elmer” program linking experienced hams with less experienced hams. We welcome everyone to our club and its meetings. Our vision is to provide all members the education, motivation, and encouragement to achieve a higher amateur radio license class; to explore the amazing facets of amateur radio; and to grow the ranks of amateur radio through support of license classes, public demonstrations, formation of middle school, high school clubs and other youth groups; and in other ways promote amateur radio in a positive common creative way. We value friendship, sharing, service, involvement, education, integrity, and commitment. The 285 TechConnect Radio Club - NAØTC provides an encouraging environment and opportunities for wiide-ranging learning experiences for the newcomer through the experienced amateur in the technical and operating areas of amateur radio.